THE WORLD’S FIRST HOLOGRAM ARTWORK. 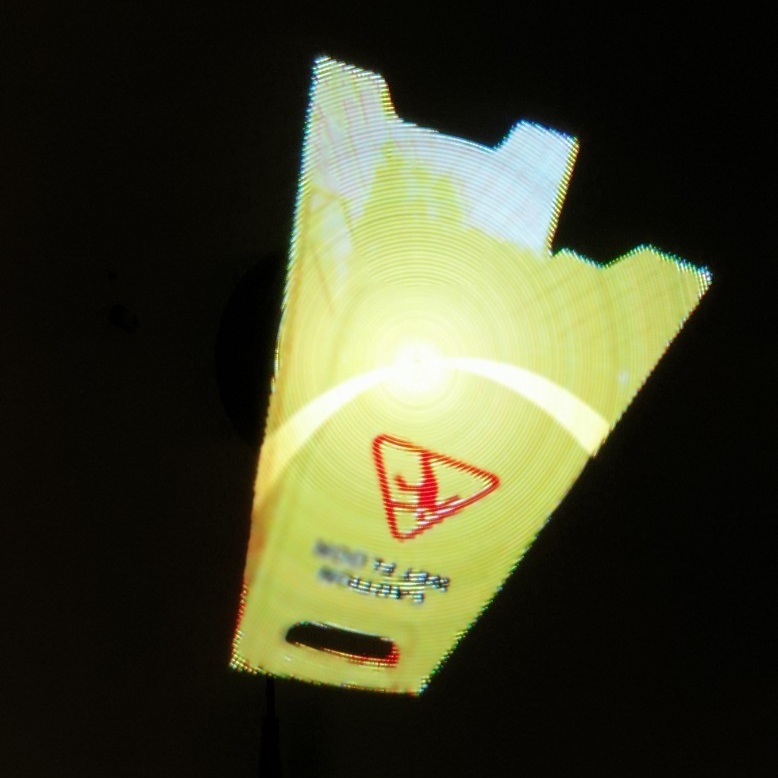 Using cutting edge technology, have Vxmadsen created a hologram in shape of a wet floor sign, the installation is a sign that spins around its own accise in different ways, which is the reason the sign appears to float in mid air. the technology is not new however, but the artwork displayed on the hologram is. 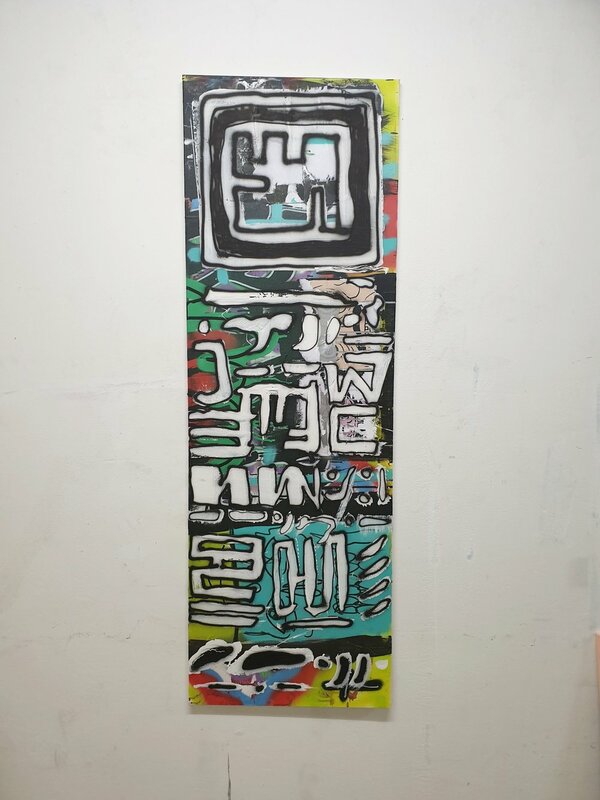 the artwork titled Caution wet floor will be auctioned of at a private viewing in denmark. Caution wet floor came to be in the studio where the artist resides in copenhagen denmark, the sign was suspended in mid air while being rotated at a gravitational point, this was filmed behind a green screen so the background could be erased for later. they say time travel is not a real , but when you time travel into the future to the year 3600 and harvest information about unknown planets and societies, and the only thing you can bring back is the writing. you are forced to paint it and communicate it as well as possible. The new line of artworks VxMadsen has created, is a fresh take on the subject of history and communication. In the (language) paintings we explore a very human aspect, which is the need for understanding, the artist is playing with fantasy and reality in a twisted but yet structured fashion. that is laying a solid foundation for some interesting works of art, the paintings draws in the viewer and upon gazing on it one can only ask what does it mean. The art from the future, can be purchased through the artist himself. By following the instruction you can schedule an appointment to visit the studio located in ballerup Denmark, book a visit below. Come by the studio and get a cup of coffee, book a visit below. The Furry Face is made of plastic faux fur and acrylic paint, the process of making a furry face is a task in of itself, in the video below VxMadsen describes his work flow creating the first furry face and the vacuum forming machine he had to build in order to get the look he was after. The piece is comprised of different elements that combined makes a fantastic work of art with the signature VxMadsen style and elegant production like finish. The Furry Face can be ordered at the low cost of only 6000 kr or $ 934 dollars. and can be ordered in colors such as pastel pink and ocean blue and of course the original forrest green, if you wish to hear more about the Furry Face or have any questions feel free to contact VxMadsen directly via Email. Short term gains by VxMadsen 65x90 cm acrylic on canvas. I HAVE STARTED A NEW YOUTUBE CHANNEL VXM REVIEWS!! Welcome to VxM reviews, i am your host VxMadsen, that is how the videos start when VxMadsen opens up his dialog about his favorite books, in VxM reviews VxMadsen goes into detail about books he loves to read, books that falls under the category money, success, creativity, drive, and passion, every monday a new video comes out so be sure to subscribe to the channel if you wanna get your entrepreneurial mindset on!! I HAVE MADE MY FIRST TWO ANDROID APP GAMES :D!!!!!!!!!!!!! DOWNLOAD COIN JUMPER NOW !!! Check out the most awesome app game of the year SCARY MONSTERS MATCH !! "they say it is so fun to play that people have to go to rehab because of how fun this game is"
DOWNLOAD IT NOW AND TRY IT OUT FOR YOURSELF !!!! Check out my clothing line, i have a whole shop for all my crazy designer cloths!!! !